At Timothy Parks Construction, Inc., our family’s objective is to make your experience better than you expect, producing in increased value of your home and your enjoyment of it for decades to come. For almost 2 decades, our crew has made it easier for Central Florida homeowners to handle their home improvement and roofing needs quickly and competently, with the thorough customer service, experienced workmanship and high-quality components. Is your roof unwanted or just falling apart? Replace it? Often, the fact of a new roof is inescapable. Replacing your roof is a major task that requires doing your preparation and finding the right contractor. In Orlando, roofing materials vary and the longevity of your roof can also vary. You should (if at all possible) begin the roof replacement process several weeks in advance with Timothy Parks. Timothy Parks Construction, Inc. is the most trusted roof replacement contractor at Thornton Park Central in Orlando, FL. Whether you’re experiencing a roof leak, noticing water damage, or your roof shingles are coming off, we are here to answer your questions and provide the right guidance for your roof repair. Our team of roofing specialists is experienced with all types of roofing systems, including algae resistant asphalt, architectural shingles, tile, slate, metal, and hot tar/flat roofs/low slope. At Timothy Parks Construction, Inc., our services meet the Florida Building Code, one of the toughest and most extensive to be found anywhere. We’re so sure about our superior service that we’ll come out and inspect your home, provide a recommendation and estimate the cost, with no obligation. Unless it’s completely obvious, an expert from Timothy Parks Construction, Inc. can help you answer that with a simple visit and analyse the condition of your roof in a clear way to find the right remedy. Timothy Parks Construction, Inc. will be able to report and provide you with analysis as to why you do or do not need a new roof. In many scenarios, simple repairs are all that is called for. However, if a full replacement is needed, a professional from Timothy Parks Construction, Inc. can best explain why it’s necessary and how the process and work will be done on your home. In fact, Timothy Parks Construction, Inc. can make the replacement process something that you, as the homeowner, hardly even notice, and they are able to do full replacement jobs in a matter of just a couple of days in some cases. By using the contact form on this site you can be contacted by Timothy Parks. They will provide you with a simple analysis, free of obligation. So even if you know you aren’t ready to replace yet, you can get an expert opinion and use that for your planning. So what are you waiting for? Contact us or call us now at 407-610-6771 to schedule a free consultation and quote. At Timothy Parks Construction, Inc., our family’s purpose is to make your experience greater than you expect, resulting in increased value of your home and your satisfaction of it for decades to come. For almost 2 decades, our staff has served Central Florida energy minded homeowners to deal with their home improvement and roofing needs swiftly and competently, with the careful customer service, expert workmanship and high-quality components. Is your roof ancient or just falling apart? Replace it? Often, the truth of a new roof is inevitable. Replacing your roof is a major task that requires doing your homework and finding the right contractor. In Orlando, roofing materials vary and the longevity of your roof can also vary. You should (if at all possible) begin the roof replacement process several days in advance with Timothy Parks. Timothy Parks Construction, Inc. is the most trusted roof replacement contractor at Center Lake in Orlando, FL. Whether you’re experiencing a roof leak, noticing water damage, or your roof shingles are coming off, we are here to answer your questions and provide the right guidance for your roof repair. Our staff of roofing specialists is experienced with all types of roofing systems, including algae resistant asphalt, architectural shingles, tile, slate, metal, and hot tar/flat roofs/low slope. At Timothy Parks Construction, Inc., our services meet the Florida Building Code, one of the toughest and most in depth to be found anywhere. We’re so sure about our superior service that we’ll come out and inspect your home, provide a recommendation and estimate the cost, with no obligation. Unless it’s completely obvious, an expert from Timothy Parks Construction, Inc. can help you answer that with a simple visit and examine the state of your roof in a clear way to find the right solution. Timothy Parks Construction, Inc. will be able to report and provide you with analysis as to why you do or do not need a new roof. In many instances, simple repairs are all that is called for. However, if a full replacement is needed, a professional from Timothy Parks Construction, Inc. can best explain why it’s necessary and how the procedure and work will be done on your home. In fact, Timothy Parks Construction, Inc. can make the replacement process something that you, as the homeowner, hardly even notice, and they are able to do full replacement jobs in a matter of just a couple of days in some cases. By using the contact form on this site you can be contacted by Timothy Parks. They will provide you with a simple analysis, free of obligation. So even if you know you aren’t ready to replace yet, you can get an expert opinion and use that for your planning. So what are you waiting for? Contact us or call us now at 407-610-6771 to schedule a free consultation and bid. At Timothy Parks Construction, Inc., our family’s goal is to make your encounter far better than you expect, resulting in enhanced value of your home and your satisfaction of it for decades to come. For almost 2 decades, our team has served Central Florida homeowners to tackle their home refurbishment and roofing needs swiftly and successfully, with the careful customer service, qualified workmanship and quality components. Is your roof unwanted and old or just falling apart? Replace it? Often, the truth of a new roof is inevitable. Replacing your roof is a important task that requires doing your preparation and finding the right contractor. In Orlando, roofing materials vary and the longevity of your roof can also vary. You should (if at all possible) begin the roof replacement process several weeks in advance with Timothy Parks. Timothy Parks Construction, Inc. is the most trusted roof replacement contractor at Eagle Creek in Orlando, FL. Whether you’re experiencing a roof leak, noticing water damage, or your roof shingles are coming off, we are here to answer your questions and provide the right guidance for your roof repair. Our team of roofing specialists is experienced with all types of roofing systems, including algae resistant asphalt, architectural shingles, tile, slate, metal, and hot tar/flat roofs/low slope. At Timothy Parks Construction, Inc., our services meet the Florida Building Code, one of the toughest and most extensive to be found anywhere. We’re so sure about our superior service that we’ll come out and inspect your home, provide a recommendation and calculate the cost, with no obligation. Unless it’s completely obvious, an expert from Timothy Parks Construction, Inc. can help you answer that with a simple visit and examine the condition of your roof in a clear way to find the right answer. Timothy Parks Construction, Inc. will be able to report and provide you with evaluation as to why you do or do not need a new roof. In many cases, simple repairs are all that is called for. However, if a full replacement is needed, a professional from Timothy Parks Construction, Inc. can best explain why it’s necessary and how the process and work will be done on your home. In fact, Timothy Parks Construction, Inc. can make the replacement process something that you, as the homeowner, hardly even notice, and they are able to do full replacement jobs in a matter of just a couple of days in some cases. By using the contact form on this site you can be contacted by Timothy Parks. They will provide you with a simple analysis, free of obligation. So even if you know you aren’t ready to replace yet, you can get an expert opinion and use that for your planning. So what are you waiting for? Contact us or call us now at 407-610-6771 to schedule a free appointment and estimate. Code can result in unsafe and hazardous conditions. corrections that require the services of a licensed contractor. had initially hired a licensed contractor. property and the possibility of fines. unenforceable (Chapter 489.128, Florida Statutes). all material suppliers and sub-contractors have been paid. 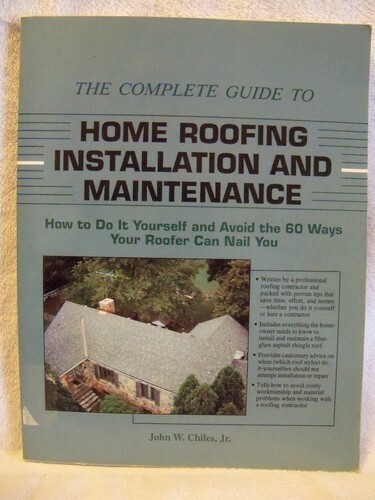 Get The Complete Guide to Home Roofing Installation and Maintenance: How to Do It Yourself and Avoid the 60 Ways Your Roofer Can Nail You at the best price available today. Timothy Parks Construction, Inc. State Licensed Roofing Contractor http://roofing-orlandofl.com Call (407) 610-6771 today for prompt service in your time of need in Orlando FL.